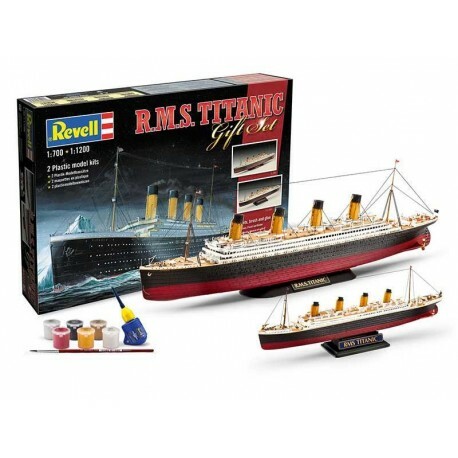 Gift set: 2 models of ships for gluing. RMS Titanic 1: 700; 38.5 cm; 132 pieces. RMS Titanic 1: 1200; 22.3 cm; 40 pieces. The packaging also contains glue, paintbrush and paints 88, 301, 302, 310, 331, 374 (14 ml). The Titanic Base was laid on March 31, 1909 at the Harland " Wolff Shipyards in Northern Ireland, and two years later, on May 31, 1911, the steamer was first launched. On the order of the famous overseas transportation company White Star Line, it carried only the most elegant and luxurious amenities. In 1912, Titanic, with a length of 269.04 m, a width of 28.19 m and a tonnage of 46,320 BRT, was the largest ship in the world. From his sister Olympic ship, Captain Edward John Smith went to Titanic specifically for his first voyage. From Southampton the ship sailed on Wednesday, April 10, 1912, and scheduled to stop in New York City in the US in Cherbourg, Queensland, Ireland. The voyage went smoothly until, after a series of warning reports of glaciers, on Sunday, April 14, 1912, around fifteen o'clock before midnight, he could not detect the patrol tower. Titanic then wiped the right side of the glacier, and after two hours and forty minutes he sank into the ice waters of the Atlantic Ocean. The disaster survived only 712 passengers. Recommended for children from 10 years of age." Instructions for use: Water-soluble acrylic paint. Mix the color well before using it. Apply with a brush or spraying on a dry, clean surface. Non-combustible base, quickly drying - non-colorable after 1 hour, completely dries in 2-3 hours, according to layer thickness. Dilute with water if necessary. By using an unsuitable thinner, the paint can be destroyed! It is cleaned with Revell Aqua Color Clean thinner. For spraying, dilution of up to 20-25% is recommended. Brush the paint and tools immediately after use with water. Close the container tightly after use. When opening, use as soon as possible, the air color dries out. Protect from frost. It contains a mixture of 5-chloro-2-methylisothiazole-3 (2H) -one and 2-methyl-isothiazole-3 (2H) -one with magnesium chloride and magnesium nitrate. May cause an allergic reaction.